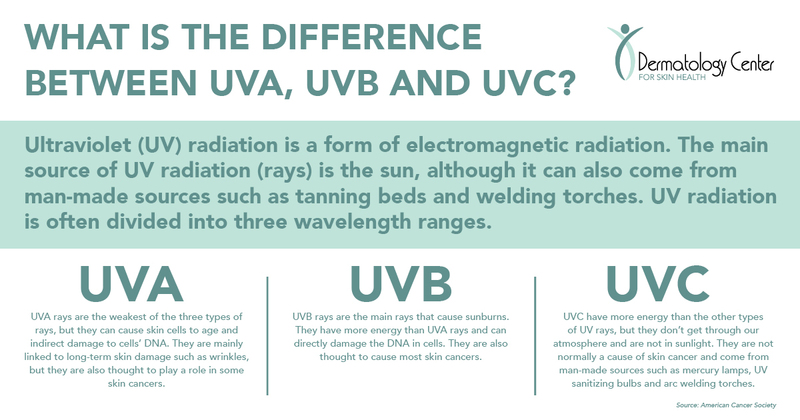 FAQ 1: WHAT IS THE DIFFERENCE BETWEEN UVA, UVB, and UVC? Ultraviolet (UV) radiation is a form of electromagnetic radiation. The main source of UV radiation (rays) is the sun, although it can also come from man-made sources such as tanning beds and welding torches. UV radiation is often divided into three wavelength ranges: UVA, UVB, and UVC. UVA rays are the weakest of the three types of rays, but they can cause skin cells to age and indirect damage to cells’ DNA. They are mainly linked to long-term skin damage such as wrinkles, but they are also thought to play a role in some skin cancers. UVB rays are the main rays that cause sunburns. They have more energy than UVA rays and can directly damage the DNA in cells. They are also thought to cause most skin cancers. UVC rays have more energy than the other types of UV rays, but they don’t get through our atmosphere and are not in sunlight. They are not normally a cause of skin cancer and come from man-made sources such as mercury lamps, UV sanitizing bulbs, and arc welding torches. FAQ 2: IS THE SUNSCREEN THAT I USED LAST YEAR STILL GOOD TO USE THIS YEAR? “Make sure you use sunscreen before the expiration date,” Dr. Gharib advises. Just like you would not want to drink expired milk, you shouldn't use expired sunscreen. Efficacy can't be guaranteed past the expiration date, meaning that you may not get the full SPF that is indicated on the bottle. With that being said, if you use sunscreen the way you're supposed to, a bottle of sunscreen does not typically last that long. You are supposed to use a full ounce of sunscreen (about the amount in a full shot glass) with each application (when applying to your entire body). So if you apply the correct amount of sunscreen, and then reapply every two hours as recommended, a standard six or eight ounce bottle of sunscreen should not last longer than a weekend. FAQ 3: WHAT IS THE BEST SUNSCREEN? There is no best sunscreen. The kind of sunscreen you use is a matter of personal choice and dependent on your skin type. What is the most important is how much is applied, how frequently is it applied, and that it has a high SPF over 30. Make sure you read the product label to achieve the UV protection indicated on the bottle. Most sunscreens need to be applied 30 minutes before getting in the sun. FAQ 4: WHAT SPF SHOULD I USE? “Individuals should wear a sunscreen that offers the above help to protect their skin from sunburn, early skin aging, and skin cancer,” Dr. Maouad advises. FAQ 5: WHAT DO YOU THINK OF SPRAY SUNSCREEN? Even though sprays are easy to apply, they need to be used correctly to cover all exposed skin. Do not inhale these products or apply near heat, open flame, or while smoking. Spray sunscreens are still being evaluated by the FDA. The challenge in using sprays is that it is difficult to know if you have used enough sunscreen to cover all sun-exposed areas of the body, which may result in inadequate coverage. In addition, if it is windy, they are very challenging to use. FAQ 6: HOW DO I KNOW IF I NEED A MOLE CHECK? OR WHO NEEDS A ROUTINE SKIN EXAM? An annual skin exam, more commonly referred to as a mole check, is a good idea for every patient. It allows patients to establish a baseline, as the average person does now know what a "normal mole" looks like or what a cancer looks like. As well, many people have had a lot of sun damage throughout their lives and may not be aware of signs of sun damage on their body. Patients with a large number of moles, a history of precancerous or cancerous lesions, a family history of skin cancer, or a history of tanning bed use, are at increased risk for skin cancer and should have routine examinations. Are you using an app to check your moles? Apps that claim to determine skin cancer should not replace your dermatologist. See why here. 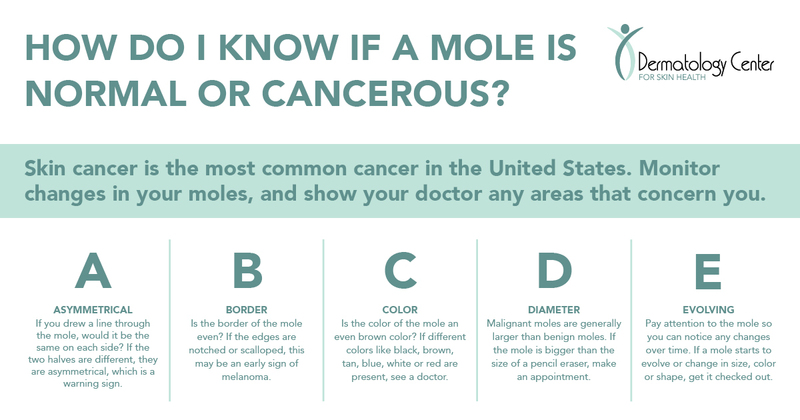 FAQ 7: HOW DO I KNOW IF A MOLE IS “NORMAL” OR CANCEROUS? It is important to know what's "normal" for you. That is why monthly self-examinations and routine examinations by a dermatologist are so important. For monthly skin checks at home, all you need is your eyes and a mirror! Having a partner to help is a plus. Look over your body monthly and if possible, have your partner help with hard to see areas such as the back, rear, and posterior thighs. Look for any new growth or changes to existing moles. If you see something new, changing, or rapidly growing, then you need to contact your dermatologist for further evaluation. The "ugly duckling" - this is basically the one lesion that looks like nothing else on your body. 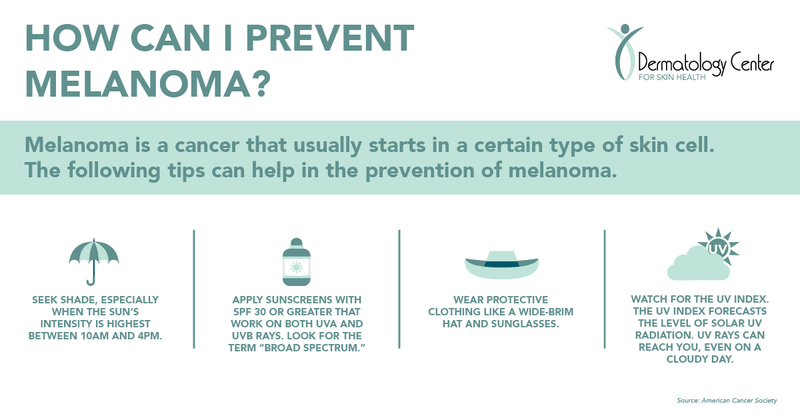 FAQ 8: HOW CAN I PREVENT MELANOMA? Melanoma is a cancer that usually starts in a certain type of skin cell. Several risk factors can make a person more like to develop melanoma. Ultraviolet (UV) Light Exposure: Protect your skin from UV rays. Sunlight is the main source of UV rays, as well as tanning beds and sun lamps. Moles: Examine your skin for changes in moles. Most moles will never cause any problems, but someone who has many moles is more likely to develop melanoma. Fair Skin, Freckling, and Light Hair: The risk of melanoma is much higher for those with fair skin, blonde or red hair, blue or green eyes, and those that freckle or burn easily. Limit sun exposure. Family History of Melanoma: Your risk of melanoma is higher if one or more of your first-degree relatives has had melanoma. Get regular skin exams. Having a Weakened Immune System: People with weakened immune systems are more likely to develop many types of skin cancer, including melanoma. Develop health habits. SKIN CANCER PREVENTION | HOW CAN WE HELP? One in five Americans will develop skin cancer at some point in their lives. Skin cancers are generally curable if caught early. Learn more about skin cancer prevention here or listen to one of our patients tell her melanoma story below. If you’ve noticed changes in your moles or have new growths, schedule a skin examination with your dermatologist today. If you’d like to schedule with on of our dermatologists, click below.